I decided to write a review recently, but I didn’t know which game to write a review for. So I closed my eyes, went to my gaming shelf, and picked out a game at random. Unfortunately, I forgot that I also keep movies on my gaming shelf, so I ended up picking Mary Poppins. …I’m not good at deciding which games to review. 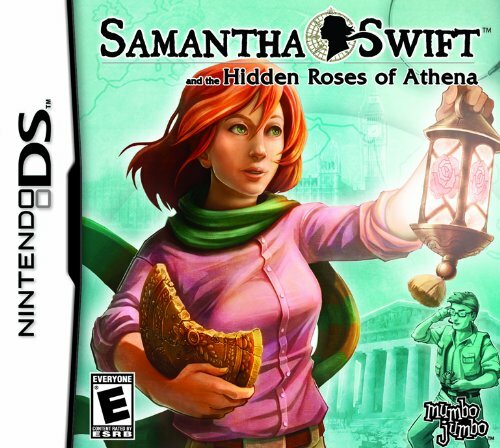 Anyway, today I’m reviewing Samantha Swift and the Hidden Roses of Athena for the Nintendo DS. For those of you who don’t know, Samantha Swift is a popular casual game series. This, the first game, is freely available to play online, so if you’re at all interested in it, I’d recommend playing for ten minutes to see what it’s like. I mean, it’s free! You can’t beat that! …I’m not sure why anyone would want to buy the DS port of a free PC game, but whatever. The best thing you can say about this game is, “Samantha Swift and the Hidden Roses of Athena is easily one of the best hidden object games for the Nintendo DS.” That’s because there are only three hidden object DS games in existence: this one, Cate West: The Vanishing Files, and the third one I can’t find because, duh, it’s a hidden object game. 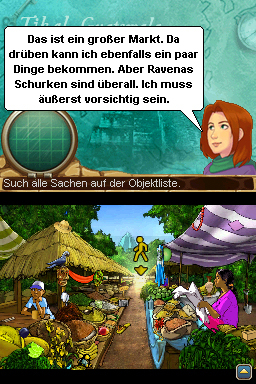 You’d think that there would be a lot more hidden object games for the DS, due to the touch screen. Then again, I thought there’d be a lot more point-and-click adventure games for the Wii, due to the Wii-mote. I guess I was wrong on both accounts. However, I now understand why there aren’t more hidden object games for the DS: the touch screen is too small. The original game runs in 800 by 600. The DS screen is, what, 257 by 192? Trying to get the two to mix is near impossible. What they do in this game is use a “zoom in” feature, where you can zoom in on the bottom screen to see the picture at normal size. It works, but it’s still kind of a pain, and you’re pretty much going to spend the entire game on zoomed-in mode. Samantha Swift is apparently fluent in German. They made a few changes to the game to make it work better on the DS. First, they completely redid the hint system. Now, you can get a free hint every twenty seconds or so. Nice! Second, they now show the bounding box for all the tool puzzles, so it’s almost impossible to miss them. Also nice! Third, the list of items you must find is now static, instead of being randomly determined. Not nice! I can understand why having a static list of items to find is easier to handle from a programming standpoint, but it sort of kills replayability, because the game is now exactly the same every time you play it. All in all, I’d say this is an “OK” game. If the DS had a bigger screen, it’d be more enjoyable. As it is, looking for hidden objects when you can only see part of the screen just feels kind of unfair. Half the time, the object you’re looking for isn’t hidden; it’s just located on a different part of the screen, which you can’t see because you can’t see the whole screen at once. Not unless you use the not-too-useful zoom out feature, that is. The other people who have reviewed this game like to point out that the price is $30. That’s reasonable for a DS game, but the PC Samantha Swift games are all $7 each. So…you could buy all four games in the series for less money than it would take to buy the DS port of the first game. Given the fact that the PC versions are superior, I’d stick with them. Especially considering that you can play this game online for free. Well done. That zoom-in feature sounds incredibly tedious and a buzz-kill from the moment you turn the game on.